It’s self-striping yarn—they look a lot fancier than they are. I learned how to knit socks about three years ago, not long after rediscovering knitting as a hobby. (It’s a wonderful hobby for introverts. It makes small talk roughly 87 bajillion times more tolerable.) Socks turned out to be the perfect project for me: they’re wearable, yet a manageable size; challenging enough to be interesting, but not so hard as to frustrate; and there are only two yarn ends to weave in, if all goes well. Plus, brightly colored socks have always been my thing. Back in high school, I was known among my friends for always giving funky (store-bought) socks as gifts. I cast on this particular pair of socks in May 2014. I worked on them through many an evening night of television, and I brought them with me on our last big pre-kid vacation. And then Little Boy was born, and I stopped knitting. It wasn’t just the lack of time, although that was a big part of it. It was the depression, and the way trying to figure out where I was on these socks seemed like an enormous and exhausting task. I’d had some problems with the yarn on the second sock, and was worried about getting the toe in the right place, and about running out of yarn. It just seemed so un-fun. Why bother? I tried, once, when Little Boy was three months old. It wasn’t enjoyable. I didn’t try again. Finally, a few months back, I left this pair in a box, found a different pattern, and started a completely different pair of socks. And all the fun I remembered came back. Not right away, but it came back—the relaxing feel of having something to do with my hands, the pleasure of making something, the daydreaming of what to make next. 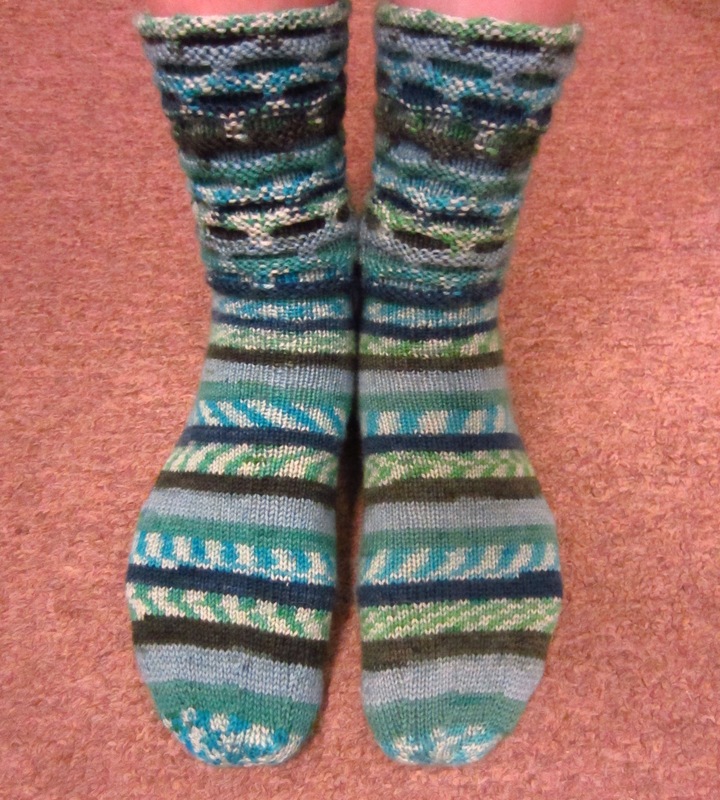 That new pair of socks isn’t quite finished, but I found myself suddenly motivated to pull these green ones back out. As it turned out, there wasn’t anything complicated left to do at all, just a few rows of straight knitting and an easy toe. All the ugh I’d imagined was just in my imagination. Here’s why these socks matter: they’re another corner turned. Another step back from depression. Another step towards life. When we first moved to the house, more than half a year ago, every noise set me on edge. Cars revving. Dogs barking. Children shouting. Leaf blowers blowing. Even the steps of pigeons on the roof reverberated in my ears like the clanging of gongs. And when there was no sound, my mind invented some. I have stood in my silent closet, looking around for the source of the music that played faintly around the corners of my hearing, only to realize that there was no music at all. I never used to be sensitive to noise, at least not outside the range of normal. As a child, I found the echo of late-night train whistles to be soothing, not disturbing. I have lived in a variety of dorm rooms with a variety of roommates, and while not all of those experiences were necessarily pleasant, noise levels were never a major issue. Heck, for three semesters in college, my window looked directly across an alley to a popular fraternity. I slept fine. Getting homework done was never a problem. Life in the apartment began as a death by a thousand cuts. There were the neighbors who left their TV on talk shows all day, the sound of not-quite-understood words spilling over into our workspace / dining room. There were the other neighbors who watched TV while going to bed, apparently clueless of the fact that they shared a wall with our bedroom and that we might, perhaps, also be trying to go to sleep. There was the fact the slam of any door reverberated through the whole building. You can’t really complain about these things, because then you’re That Neighbor Who Complains. TV noise carries through walls; it just does. Dogs bark. Children play. The neighbors with the fancy new speaker system turned it down when the apartment manager finally bothered to pass on our message about it. The kid bouncing the basketball moved on when asked politely. It got into my head, though. Instead of getting used to the noise and tuning it out, my brain began to expect it and go looking for it. It hoarded and guarded its quiet time, never knowing when it would next be interrupted by a bang or a bark or the irregular mumble of a TV. It grew protective and angry and paranoid. It would’ve just been another fact of life, something I would have had to learn to cope with, if it hadn’t been for the last set of upstairs neighbors. I’ve written about them before—they were one of the major factors contributing to my postpartum depression, and to my husband’s. Their thuds and bangs and bumps and stomps never stopped, not even at night. It sounded like they were rearranging furniture on a daily basis. Even earplugs couldn’t keep out the sound. We woke when they woke, which was somewhere around 5:30 in the morning. We left that apartment, at the cost of a buy-out fee of two months’ rent, with two months left on the lease. The manager was puzzled—why not just keep living there for those two months, since we had to pay the rent anyway? We couldn’t. It was driving us literally insane. I no longer hear phantom music. Loud music, though—real music, thumping and bumping with bass—still triggers a fight-or-flight reaction. Blood pressure rises. Anxiety spikes. Make it stop make it stop make it stop. The memory of when the noises never stopped brings on the fear that they never will again. And every day that goes by in a house with solid walls and normal, pleasant neighbors, I get a little bit more normal again.